So what happens in a single day of one's life? 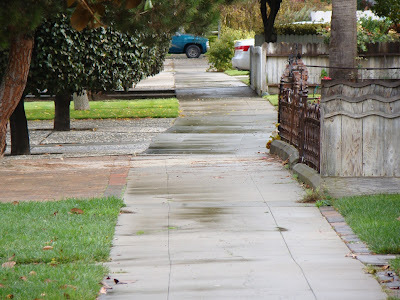 Somehow, today involved a medical appointment, brunch with Mrs. Geotripper, watching the rain fall (it's rare enough here to be a spectator sport), grading some papers, and teaching an evening class. Pretty busy I guess, and pretty mundane, but if I had one day to go in my life, this hasn't been the kind of day I would choose. What would you choose? Where would you want to be, what would you want to do? 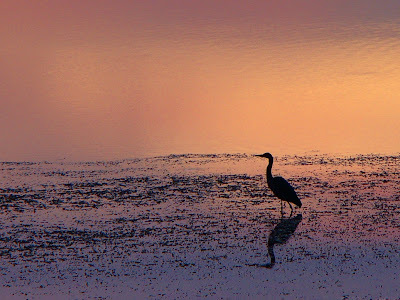 If I was ever given the choice, I suspect my final day would be something like the one I've been describing for the last four posts in the "Abandoned Lands" series. I would want to see as much of the most beautiful corners of the world as I could, and the landscape encompassed by Arches National Park, Canyonlands National Park, and Dead Horse Point State Park in east-central Utah just about fits the bill. From a fiery sunrise, it progressed to a hike to see the largest arch in the world, and a look at some wonderful arches in the Windows Section of of the park to some incredible pictographs and petroglyphs in Nine-Mile Canyon (the pictures at this link are from an earlier trip), and some sweeping vistas at Canyonlands and Dead Horse Point. It was a long day, but there was one more act. Most of the students elected to watch the sunset from a perch near Delicate Arch, but I'd done that a few times. Plus, the camp cook crew needed a ride back to the campsite, so I drove them up to the end of the road at Devils Garden Campground. And then I took off on a new trail I had never followed before. It was a short trail out to Broken Arch. The trail followed several fissures in the fins east of the campground and then climbed across the barren slickrock to a ridgetop that offered a nice panorama to the north and west. A singular Juniper survived in a sandy crack along the ridge. The trail then dropped through a deep fissure to a sage flat. The La Sal Mountains, massive laccolithic intrusions that exceed 12,000 feet in elevation were framed by the fins. Truth be told, I had kind of wandered off from the campsite without telling anyone where I was, and I had no flashlight, so with the sun going down, I knew I had to turn around before it got too dark. The fins rose high against the darkening sky. 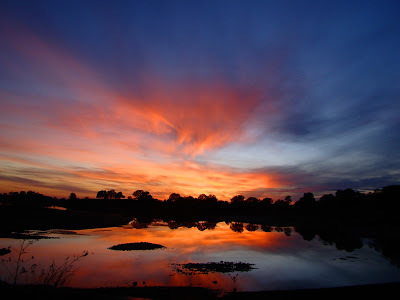 I came over the ridgetop to the sight of one of the most glorious sunsets I had ever seen, and I've seen a great many of them. To call it a fiery sky carried kind of a double meaning because a wildfire had broken out in the distance, adding reds and browns to the yellows and oranges of the setting sun. Yeah, this is the kind of day I would have if it were the last day of my life, and if I was surrounded by my friends and family (and on this trip I was, actually). But given an actual choice I would bargain for a few more days. There are still too many places I haven't seen yet. And now we were headed into the canyon lands, preserved as Canyonlands National Park and Dead Horse Point State Park. This province of the Colorado Plateau has been deeply incised by the Green and Colorado Rivers, enough to expose upper Paleozoic sedimentary rocks. We hadn't seen rocks that old since we left the Grand Canyon ten days earlier. The late Paleozoic rocks at Grand Canyon had been a mixture of marine and terrestrial rocks, but in Canyonlands, the bright red colors told us the rocks were almost exclusively terrestrial. Except for one thin bit of beach sand ...a layer called the White Rim Sandstone (below). From our perch at Grandview Point, we were looking at the last advance of a seashore in Permian time, some 270 million years ago. It would be tens of millions of years before seas would once again cover the region. This is a vast empty quarter; it's hard to imagine making any kind of living here, but people migrated into the region, and most abandoned it soon after. The Native Americans made the maybe the most successful effort, with evidence of Archaic peoples arriving thousands of years ago. The Ancestral Pueblo people occupied the region from 200 BCE, and another group, the Fremont, arrived around 800 CE. Both groups abandoned these lands before 1300. It was several hundred years before others reoccupied the land, with the arrival of the Utes, the Paiutes, and the Navajo. The Spaniards largely ignored the region, but outlaws in the late 1800s utilized the intricate canyons as hideouts. One after another, others moved through this landscape: ranchers, uranium miners, trappers, gold miners, oil drillers. And then they moved on. In the early 1960s, riches of a different kind were recognized: the scenic nature of the canyons. In 1964, Canyonlands became a national park. In contrast to the vast expanse of Canyonlands, Dead Horse Point is a miniscule property of just over 5,000 acres (8 square miles). But what a spot! It is perched on the edge of a 2,000 feet cliff overlooking the Colorado River and the eastern side of Canyonlands National Park. There was an interesting spider in the picnic area, too! Anyone know what kind it is? It's a strange feeling...NOT traveling for the Thanksgiving holiday. But it didn't keep us from taking a little excursion the other day. 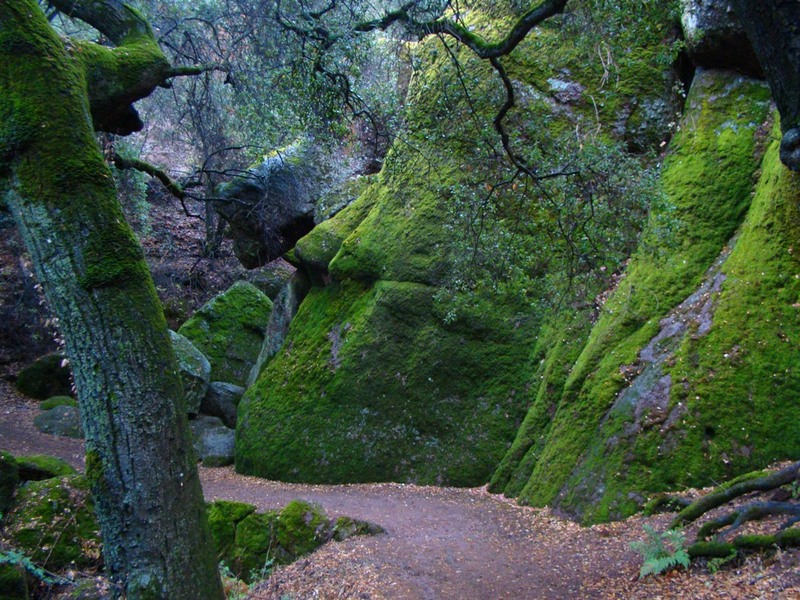 The Sierra Nevada foothills, which rise just a short distance east of my town, are one of the most utilized terrains in California. The land was pretty well overturned by the gold seekers in the 1850s: some parts were blasted with water cannons (hydraulic mining), while bottomlands near the Tuolumne River were dredged. The low hills were deemed a good spot to build reservoirs both small and large to harness the power of the river and to provide irrigation water for the valley below. The remaining open spaces were utilized by cattle ranchers for livestock grazing. And these days, fruit orchards are expanding eastward into the mountains. 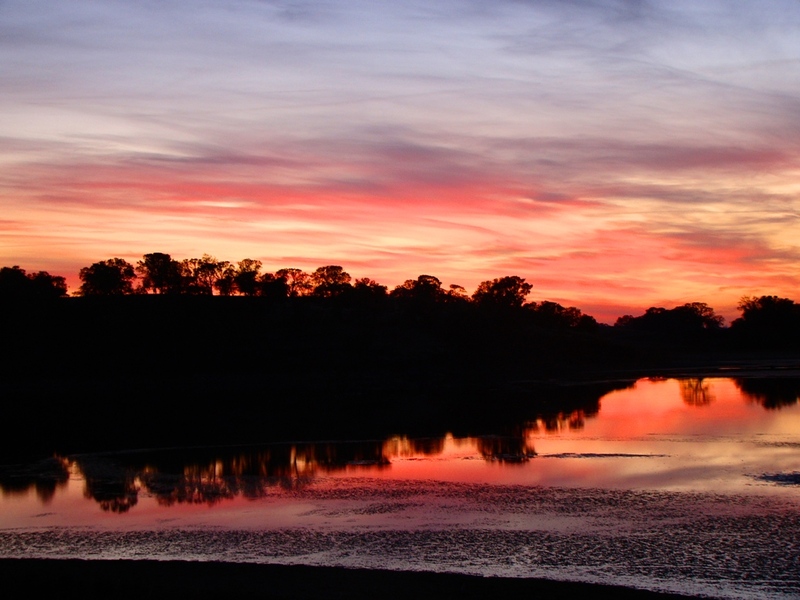 One of the earliest dams was constructed on the Tuolumne River near La Grange. 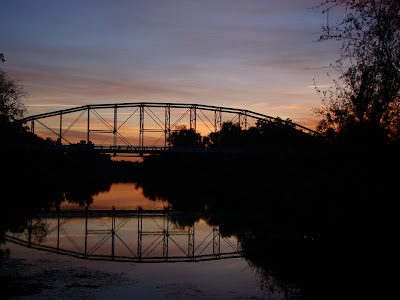 La Grange Dam was completed in 1892, and is used to divert some of the river into a series of canals and levees that allow the irrigation of tens of thousands of acres around Turlock and Modesto. One of the canals flows into a small reservoir called Dawson Lake. That's where we found ourselves as the sun was setting. Sunsets have a way of taking mundane landscapes and turning them into something beautiful. 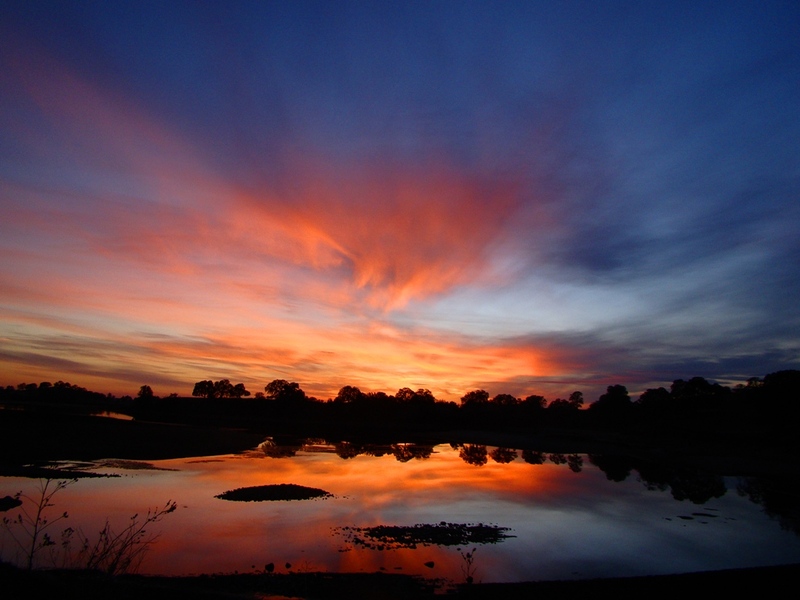 The lake was nearly empty, but enough water remained to reflect the fiery skies. 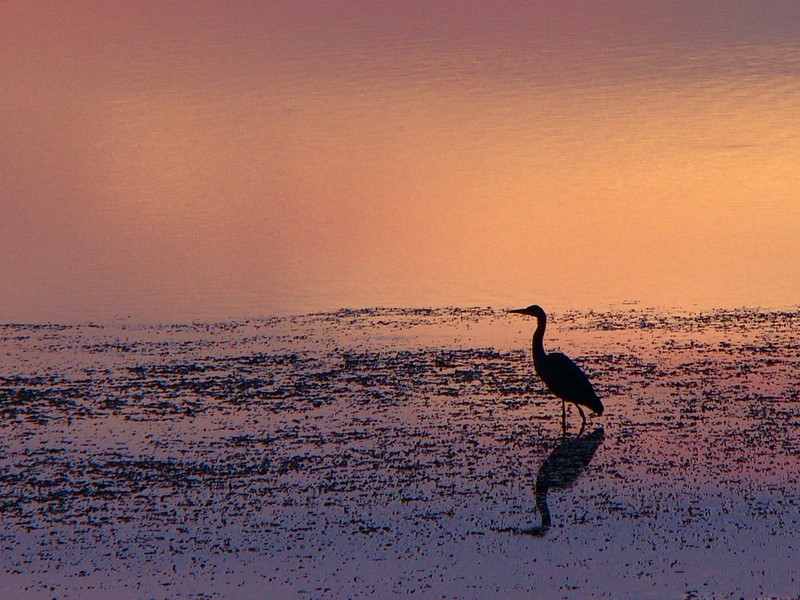 An egret was looking for the last few fish in the shallow ponds. 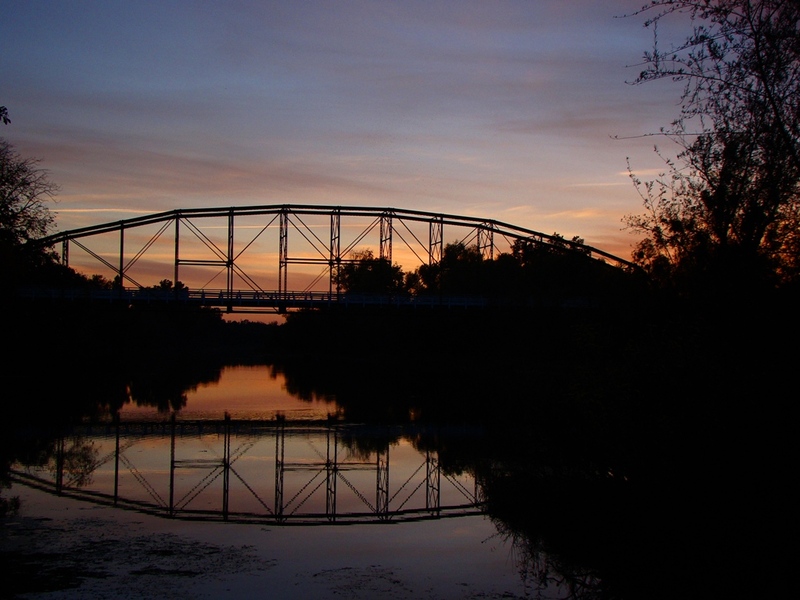 We took a brief look at Old Basso Bridge, which was built over the Tuolumne River about 1911, and was retired from service in 1986. It is preserved for pedestrian use these days (apparently one truck accident in the right spot could have collapsed the entire structure). It was a pretty afternoon, a release from a couple of stressful weeks. I have lots of things to be thankful for. The land I live on is one of them. 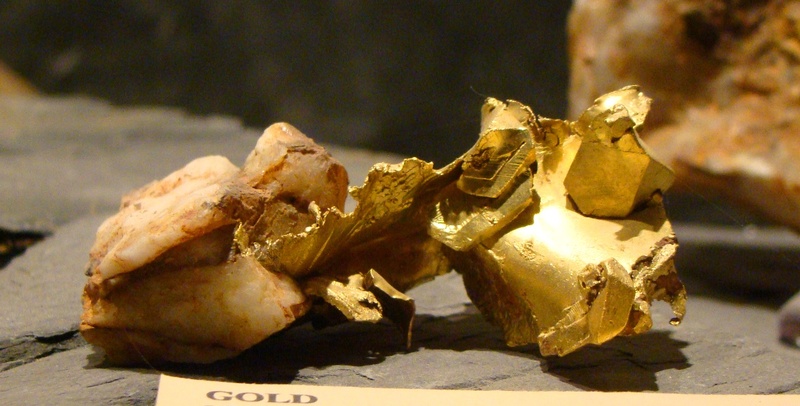 How does a cave originate? Most often, solution of limestone or marble is a cause, and lava flows will sometimes develop lava tubes. Coastal waves will carve out sea caves. There are a few other kinds of caves, but the caves at Pinnacles National Monument are rather unique. They are talus caves. The term 'talus' refers to the chunks and blocks of rock that usually accumulate at the base of cliffs. The rapid journey of a rock down a cliff usually has the effect of shattering the larger boulders, so openings in the talus piles are rarely large enough for humans to explore for any length. The circumstances at Pinnacles were different. Pinnacles National Monument preserves a large rhyolitic stratovolcano dating to around 23 million years ago. The layers along the mountainsides appear to have been tilted, but they actually preserve the original steep slopes of the volcano. 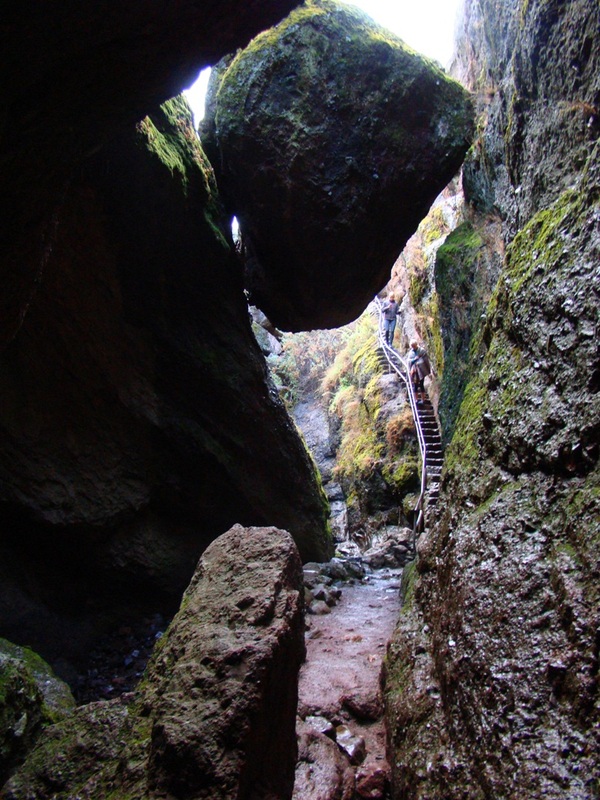 Vertical fractures called joints are present throughout the rock exposures, and erosional forces took advantage of the joints to form deep slot canyons with near vertical sides. As the slot canyons grew deeper, large chunks of the rhyolite flows and lahar deposits slid down the slopes and into the canyons without falling any great distance. 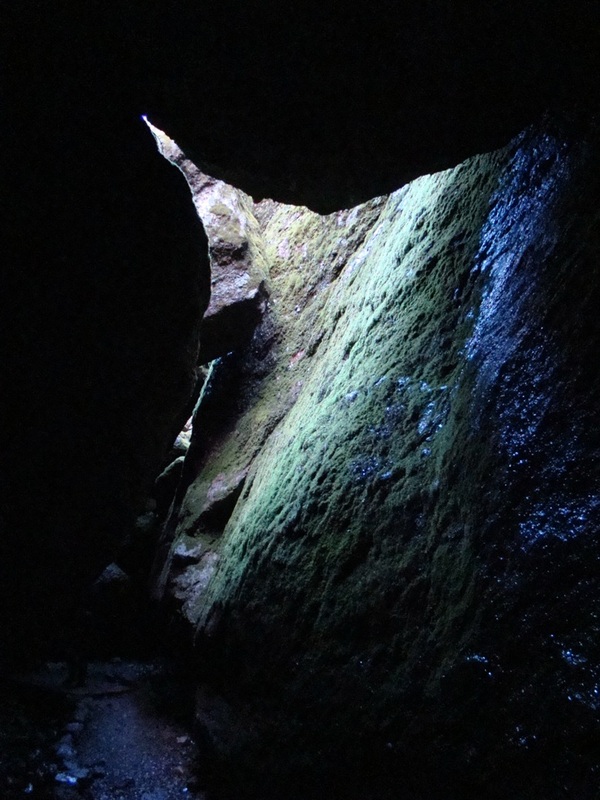 Eventually the huge boulders filled the slot canyons, forming a ceiling over the watercourse deep below. Two cave systems are accessible at Pinnacles for exploration, the Balconies Caves (500 feet long), and Bear Gulch Caves (1,700 feet long). Both are long enough to require flashlights. 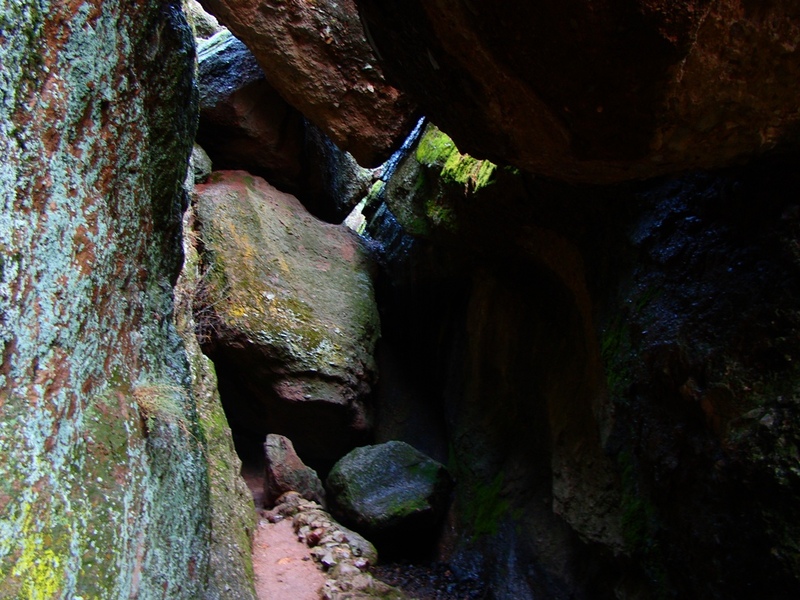 I haven't been in Balcony Cave yet, but last Saturday I made sure to climb through Bear Gulch. The Civilian Conservation Corps put in a series of stairways in the 1930s, and every time I walk through I see images in my head of hobbits, dwarves, and the Mines of Moria. They are that cool looking! 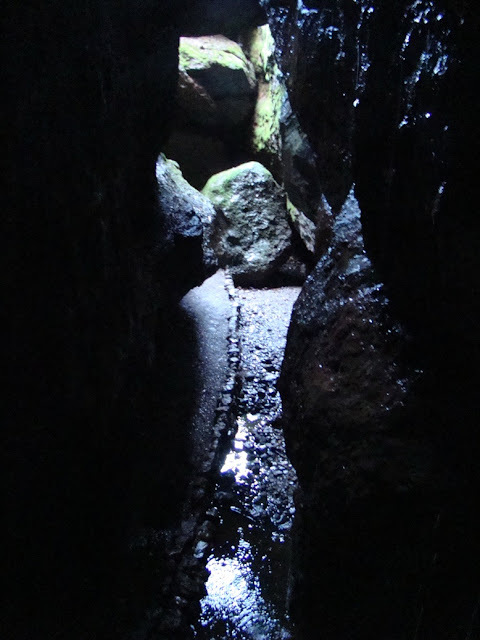 We reached Pinnacles last Saturday on the heels of a decently heavy rainstorm, which added a whole new element to the exploration of the caves. There is almost always a small trickle of water flowing through the deepest part of the cave, and there are several small waterfalls in the cave passages. But when I walked through the other day, the water was also pouring off the boulders, causing an odd underground rainstorm. The splashing water reverberated throughout the cave. 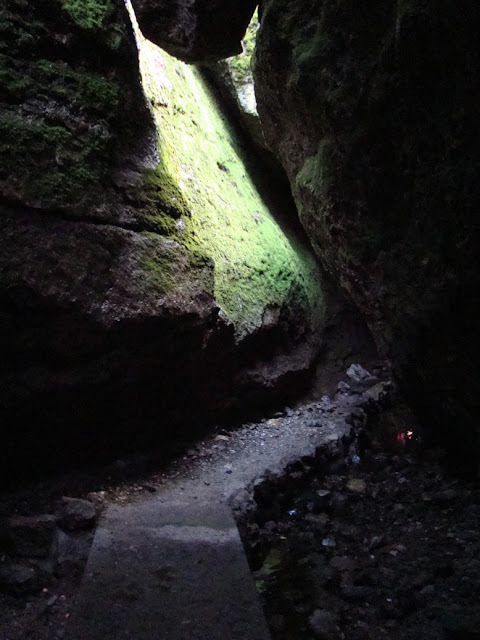 The caves are intermittently closed because the cave also hosts the largest colony of Townsend's big-eared bats between the Bay Area and Mexico (click on the link for closure information). There is occasionally a flooding hazard as well. The main closure is between May and July when the young bats are being born and cared for. The lower cave is open for much of the rest of year, but one should check before visiting. I don't know of a great many other talus caves. When I was quite young I remember exploring the "Indian Caves" on the north side of Yosemite Valley, but their existence is no longer emphasized by the park service (I suspect that animal life in the cave was being severely impacted by visitation and garbage strewing). 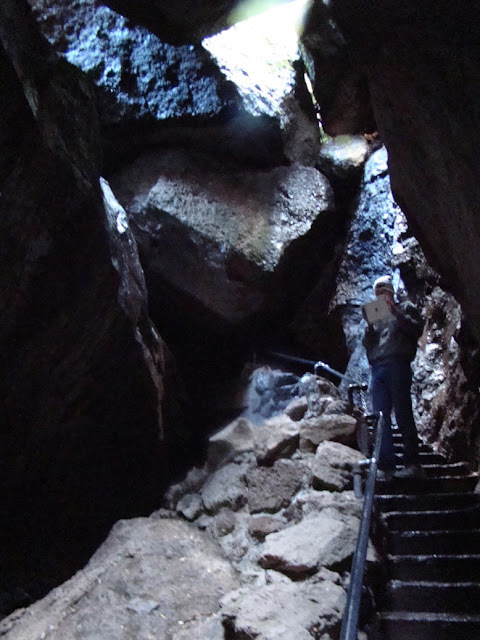 I also spent some time exploring Elsie's Cave in the Big Bear Lake area of Southern California. Beyond that, zilch. 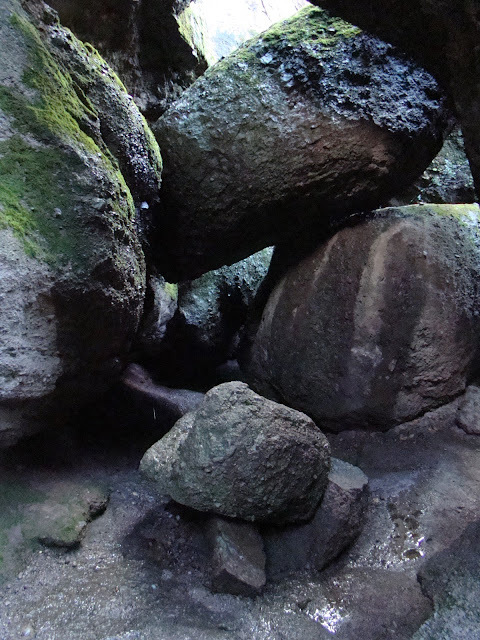 Does anyone have some stories of interesting talus caves in your region? It was our last field studies trip of the year. 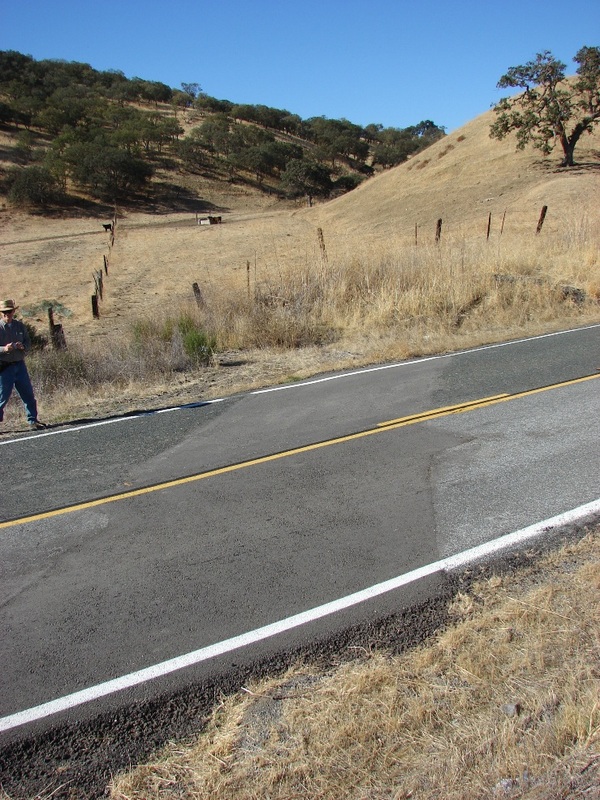 After our explorations of the San Andreas and Calaveras faults in the Hollister region of the Coast Ranges, we headed south on Highway 25 to Pinnacles National Monument. 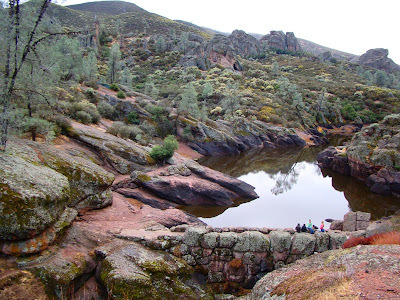 Pinnacles is one of our unheralded gems, a beautiful landscape with an unusual origin. 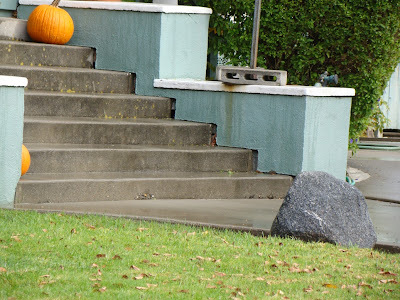 The rocks are strange looking, and far out of character with the "normal" rocks of the Coast Ranges, which tend to include graywacke sandstone, shale, serpentine, and some occasional expanses of granite and metamorphic rock. The knobby rocks in the photo above are the result of volcanic mudflows and lava flows. 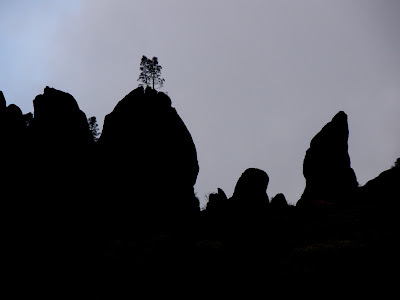 The Pinnacles are the eroded remnants of a 23 million year old volcano. The scenery was so unique that President Teddy Roosevelt declared the region a national monument in 1908, just two years after the first monument was established at Devils Tower in Wyoming. The small Bear Gulch Reservoir was constructed by the CCC during the Great Depression. It is maintained as wildlife habitat today (especially for the amphibians, which have suffered disastrous declines in recent years). 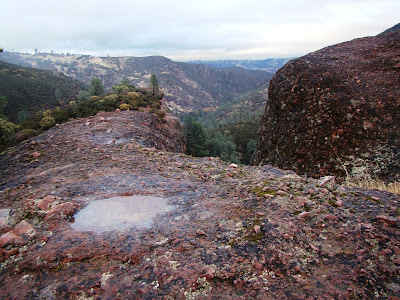 The park preserves the remains of five rhyolitic cones that once may have towered 8,000 feet high. Erosion has attacked the volcanic rocks with a vengeance, widening cracks and fissures to form the pinnacles for which the park is named. 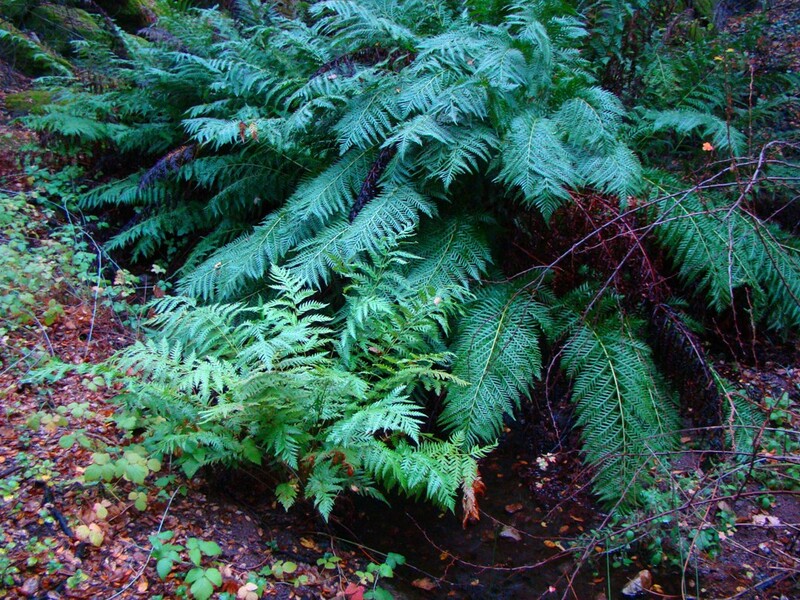 The mountain ridges are fairly arid, covered mainly with shrubs and Gray Pines, but deep in the canyons and gorges, pockets of cool moist air and permanent springs allow much more lush vegetation to thrive. And yes, I realized I was standing next to poison oak (lower left side of the photo above). 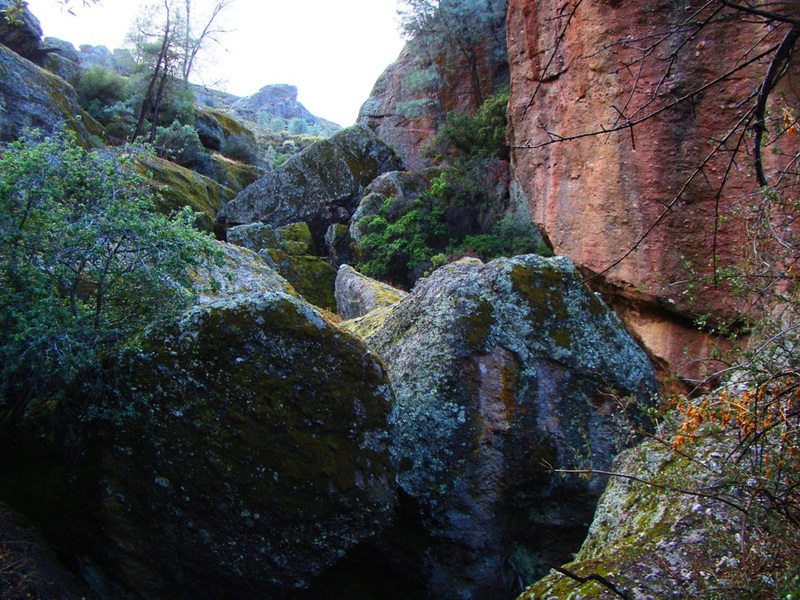 No one realized it in 1908, but Pinnacles preserves one of the more exciting bits of geology in the state of California. By 1977, geologists had realized that Pinnacles was only half of the original volcano, and that the other half was on the far side of the San Andreas fault...some 195 miles away in southern California near Lancaster in the Mojave Desert. Down south, the rocks are called the Neenach Volcanics. 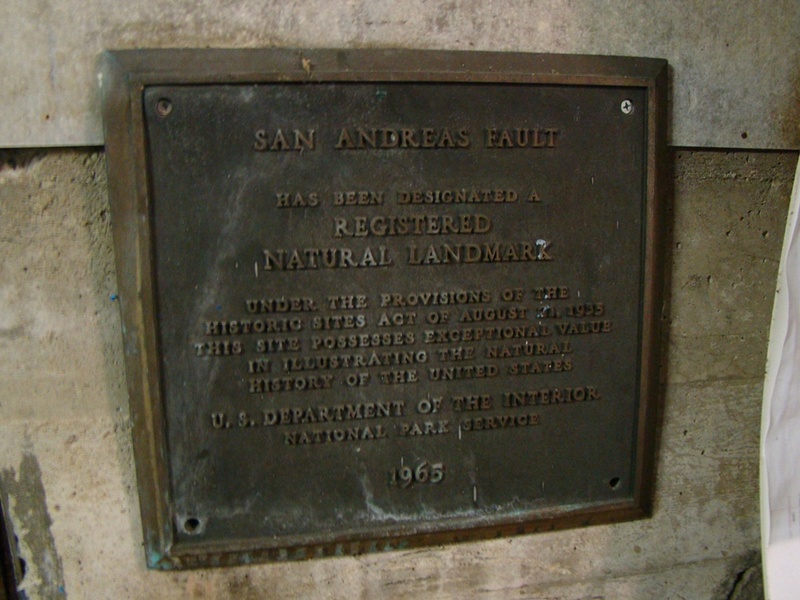 Such huge lateral offsets provided overwhelming evidence confirming the theory of plate tectonics (the San Andreas fault is a transform-style plate boundary). I'll wrap up my exploration next time in the unique caves of Pinnacles National Monument. 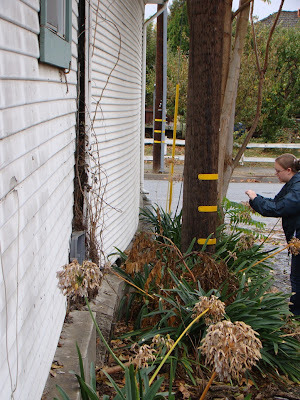 It was the third weekend in November, and thus time for our last field studies excursion of the year. 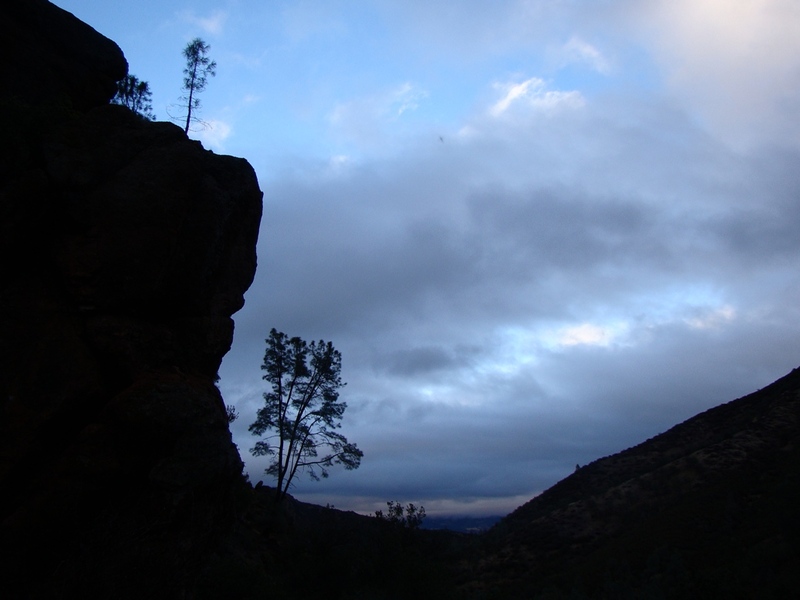 We headed into the Coast Ranges of California, braving rain and wind for a chance to investigate the San Andreas and related faults, and to explore one of the lesser-known gems of the National Park System, Pinnacles National Monument. One of our first stops (and indeed a stop for practically every field class that ventures forth into Central California) is the town of Hollister, south of San Jose, and sitting right on top of the Calaveras fault. 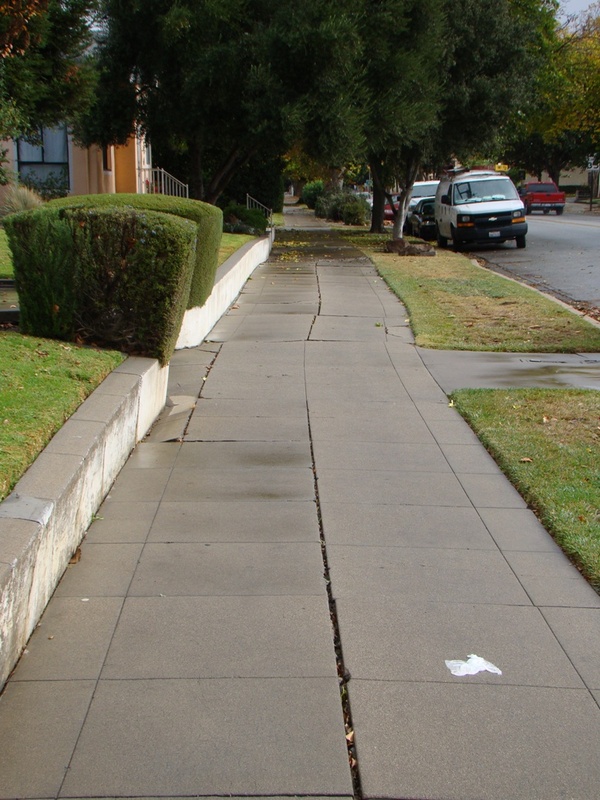 The Calaveras fault is an offshoot of the San Andreas, separating from the main fault a few miles south of town. 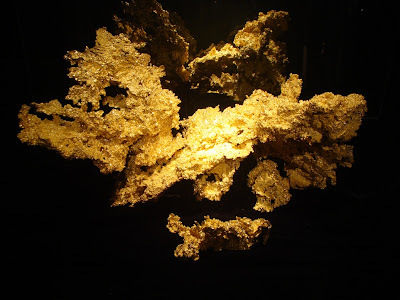 The Calaveras is quite clearly active, as can be seen in these photos. 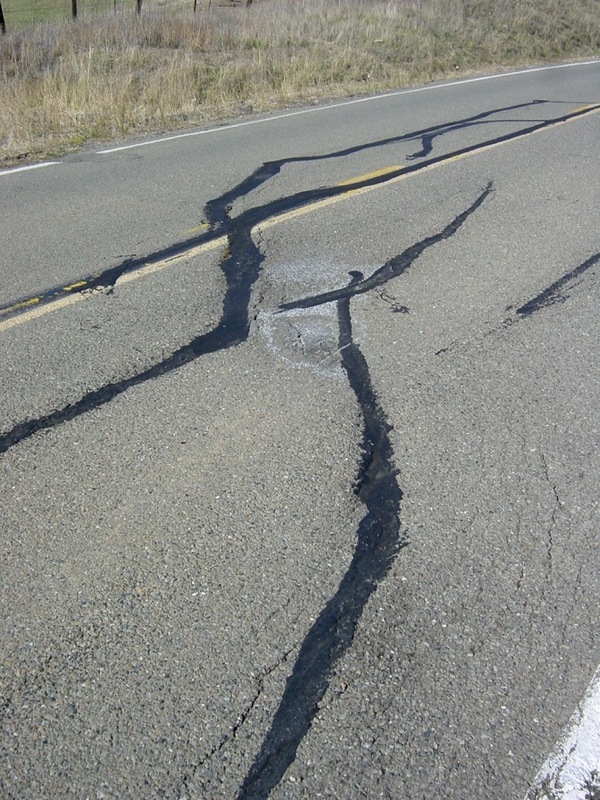 The fault is well-known for creeping rather than sticking and slipping (and producing ruinous earthquakes). The fault moves at rates as high as half an inch per year, although the rate is highly variable. 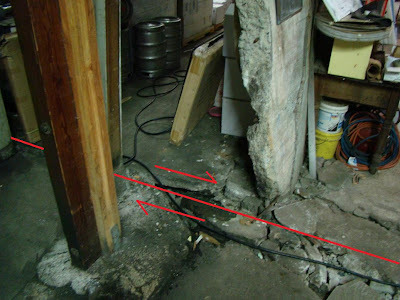 The fault runs through numerous homes, and the movement is slowly tearing the foundations apart. Every decade or so homeowners must lift the houses up and replace the foundations. The fault is easily traced in the neighborhoods between 1st Street and 6th Street at Dunne Park. I've noticed that folks living on the trace of the fault barely look up from their porches as classes walk down the street following the fault zone. A few are proud enough of their notoriety that they will come and describe what they've been doing with their faulty houses. 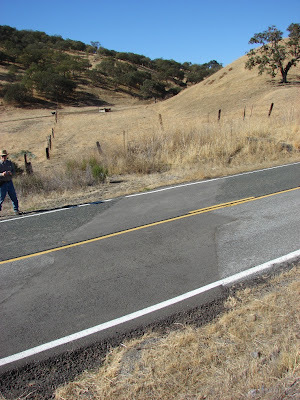 Our trip route took us south of town, to where Cienega Road intersects and then follows the San Andreas fault. 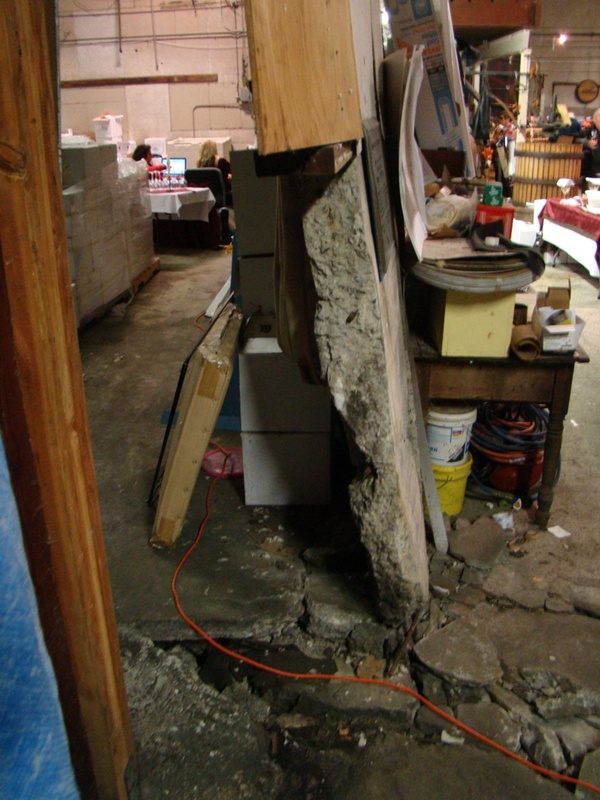 Beyond the Hollister Hills State Recreation Area, one reaches the DeRose Winery, another famous fault locality. The winery was built directly on the trace of the fault, and has been destroyed twice by creep along the San Andreas. The owners have always been kind to our students, allowing us to sneak through the wine-tasting event to have a look at the interior walls, which have been offset by several feet (below). 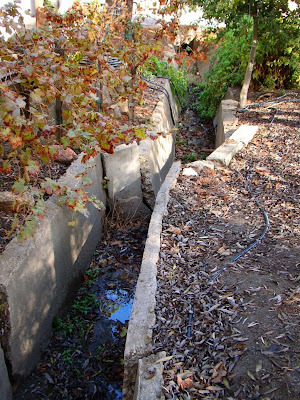 The water-course at the south end of the winery is one of the most famous drainage culverts in existence because of how it has been offset by the fault (I forgot to get a picture this year; this is last year's version). I don't know if realtors have to disclose the fault problems of home-buyers in Hollister, but if the DeRosa owners ever have to sell their winery building, they'll have a hard time hiding their fault...there is a brass plaque in the middle of the building declaring it a Registered Natural Landmark by the Department of the Interior! 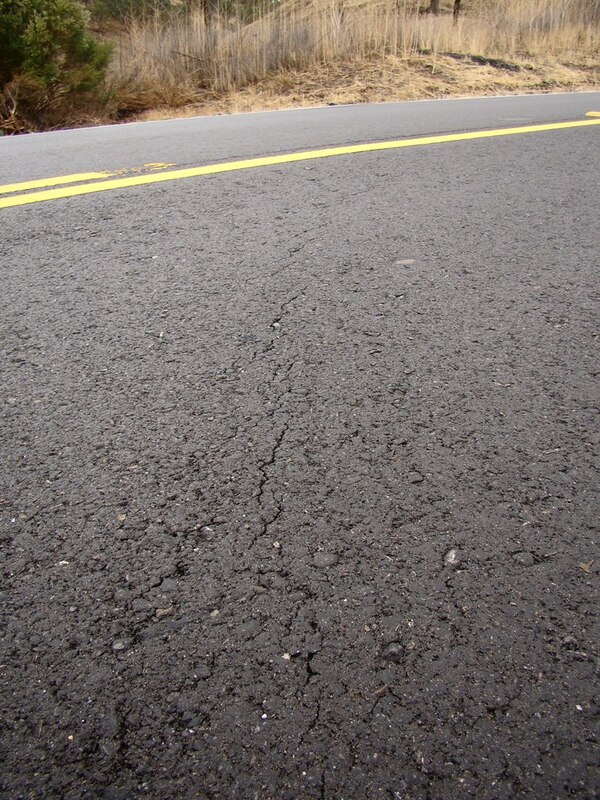 The other San Andreas fault locality for our trip is on Highway 25 where the road is traversed by the fault. 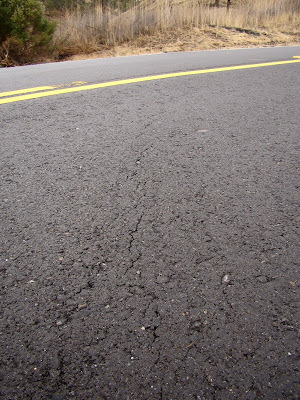 The road was completely repaved in the last year or two, but if you look carefully, you can see that the fault is already at work tearing the road apart again. 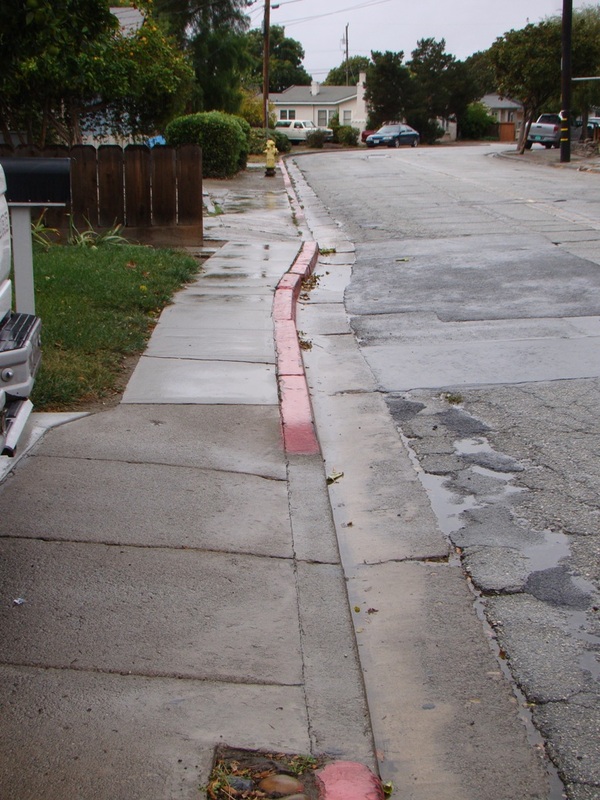 ...and a shot from 2008 after a patch job. 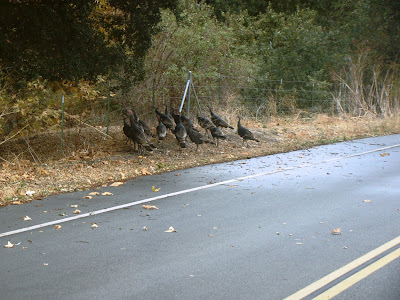 We had an audience at our stop...a gang or rafter of dinosaur descendants trying to avoid being the main course later this week! 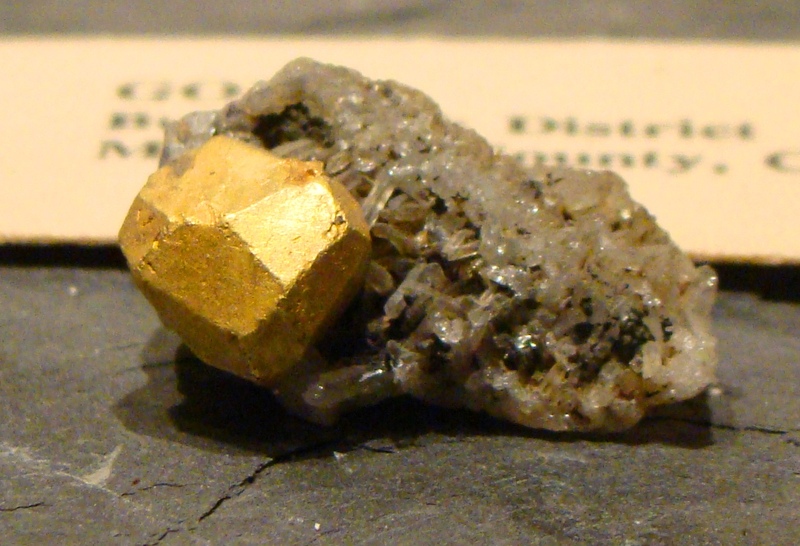 Arrests have been made in the robbery of gold specimens and other minerals from the California State Mining and Mineral Museum in Mariposa last September. Four suspects have been arrested by the California Highway Patrol, but there is no news yet as to whether the stolen specimens have been recovered. Details can be found here, and here. It has never been made clear which nuggests were stolen, but they didn't get away with the biggest and most famous nugget, the Fricot (top picture) because it was displayed in a fortified safe that the thieves couldn't breach. 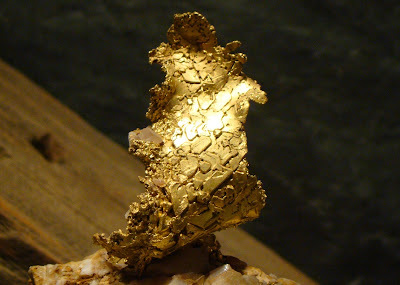 The other nuggests pictured here were probably part of the loot, as they were in display cases with thinner windows (the robbers had pickaxes). The samples are especially significant because they show a rare aspect of gold nuggets: crystal form, especially that shown below. I'm glad they have caught the (alleged) thugs, and I hope they recover these beautiful specimens.